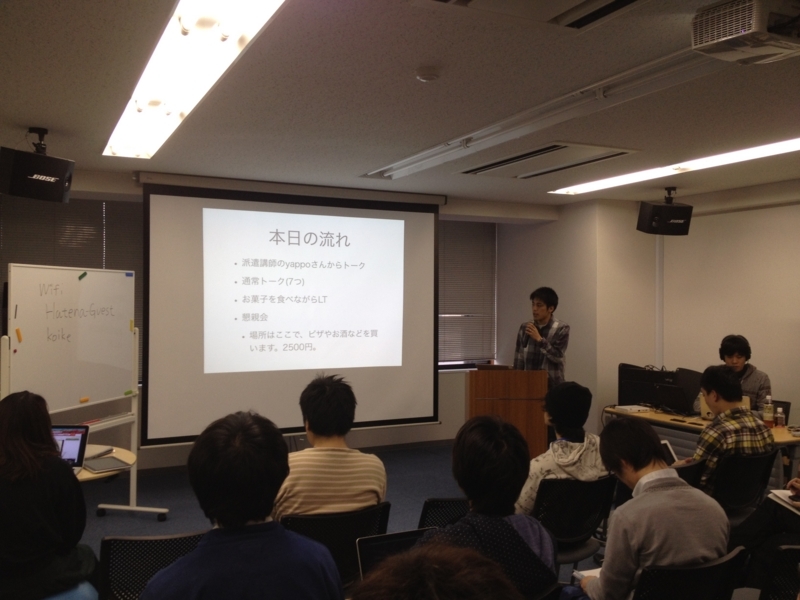 Today, id:shiba_yu36 finally launched yet another Perl community, Kyoto.pm! Congratulations! He has done a lot of work for it. I'm really grateful for his leadership and looking forward to the community's promising success. I, of course, also gave a presentation about one of my current works: Data::Mapper, about which I wrote a bit some times here. Here's my slides. It wraps up my idea and the usage of the module. Thanks to JPA, @Yappo appeared as a special guest from Tokyo. He talked about his various works, especially, Acme-related things which were built by amazingly deep techniques. I hadn't known Acme::FizzBuzz consisted of such complicated codes! Check the code out. You'll definitely have fun from it. In addition to Yappo-san, several Perl mongers, @nekokak, @xaicron, @Cside, etc., came to Kyoto.pm. Really great and I felt very glad to see them. We held a well-done party after tech-talks. I got a bit tensed up to talk about ORM with nekokak-san who is an ORM master.